A new set of high-velocity impact experiments from Brown University reveal that the dwarf planet Ceres may be something of a cosmic dartboard: Projectiles that slam into it tend to stick. The experiments, performed using the Vertical Gun Range at NASA’s Ames Research Center, suggest that when asteroids and other impactors hit Ceres, much of the impact material remains on the surface instead of bouncing off into space. The findings suggest the surface of Ceres could consist largely of a mish-mash of meteoritic material collected over billions of years of bombardment. The research, by Terik Daly and Peter Schultz of Brown University, is published in Geophysical Research Letters. Ceres is the largest object in the asteroid belt and the nearest dwarf planet to Earth. Until the recent arrival of the Dawn spacecraft, all that was known about Ceres came from telescopic observations. The observations showed Ceres to be mysteriously low in density, suggesting it is made either of very porous silicate material, or perhaps contains a large layer of water ice. Observations of its surface were remarkable as well — largely for being unremarkable. And to understand impact processes, the researchers turned to NASA’s Vertical Gun Range, a cannon with a 14-foot barrel that can launch projectiles at up to 16,000 miles per hour. For this work, Daly and Schultz wanted to simulate impacts into low-density surfaces that mimic the two broad possibilities for the composition of Ceres’s surface: porous silicate or icy. “The idea was to look at those two end-member cases, because we really don’t know yet exactly what Ceres is like,” Daly said. For the porous silicate case, the researchers launched impactors into a powdered pumice. For the icy case, they used two targets: snow, and snow covered by a thin veneer of fluffy silicate material, simulating the possibility the Ceres’s ice sits below a silicate layer. 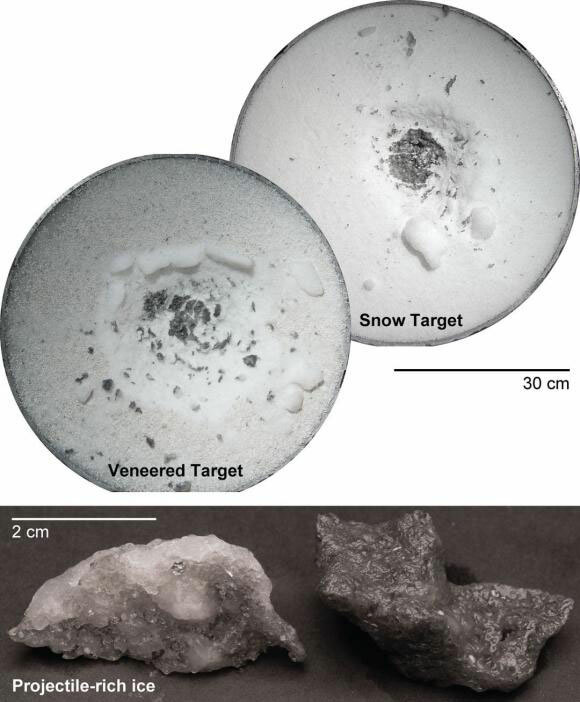 They then blasted these targets with pebble-sized bits of basalt and aluminum, simulating both stony and metallic meteorites. The study showed that in all cases, large proportions of the impact material remained in and around the impact crater. This was especially true in the icy case, Daly said. Icy collision: Researchers simulate collisions into an icy body at the NASA Vertical Gun Range. Much of the dark impact material stays in the crater. The results were a bit of a surprise, said Schultz, who has studied impact processes for many years as professor of earth, environmental, and planetary sciences at Brown. Over billions of years of such impacts, Ceres may have accumulated quite a bit of non-native material, Daly and Schultz said, much of it mixing together to create the relatively nondescript surface seen from telescopes. The researchers are hopeful that as the Dawn spacecraft scans the surface at much higher resolution, it might be able to pick out individual patches of this delivered material. That would help confirm the relevance of these experiments to celestial bodies, the researchers say. 2 Comments on "Surface of Ceres Consists of Billions of Years Worth of Meteorite Material"
If all objects in the Asteroid Belt are orbiting the Sun in the same direction, why is such a high impact velocity assumed? For objects of equal mass and equal distance from the Sun, the orbital velocity will be the same and hence their relative – impact – velocity would be zero. That is: the Asteroid Belt should be like a huge fairground carousel. The situation concerning space junk in LEO is different, because there it is quite possible for objects of equal mass and equal orbital radius, hence equal orbital velocity, to be rotating in opposite directions, so that their relative velocity would be double the orbital velocity. Ceres itself is in the asteroid belt around the Sun between Mars and Jupiter. So, it is a dustbin of all the asteroids for billions of years many of which are freely floating and the majority getting embedded in the huge Ceres planetoid. Only those asteroids escaping this orbit will hit the Mars, Earth, Venus and Mercury on their transit towards the Sun. First filter of asteroids can be found around Saturn in its rings and Jupiter and its rings. Even earlier Uranus and Neptune would have welcomed the guests. One more thing! These asteroids are themselves the shooting stones of the cometary belt called Kuiper belt which are the very distant guests of our solar system, meaning therefore that they are the primordial stones in the formation of our galaxy, including water, and amino acids which they bring as gifts for the surviving planets. This phenomena should be the universal pattern for all the exo-planets also of other star systems also in our galaxy. Thank You.